International scholars Dr. Monica Hanna and Dr. Anne Porter investigate the positive work currently being undertaken in the Middle East to protect local antiquities and sites, and the changing levels of engagement of archaeologists with local communities. Hanna and Porter will shine a light onto the current state of archaeology and heritage preservation, but also address what local Canadian communities can do to participate in global solutions. Faculty and students at the University of Toronto’s Department of Near and Middle Eastern Civilizations and the Royal Ontario Museum have been working actively to promote a better understanding of the long and coloured histories within countries such as Syria, Iraq, Egypt, and Afghanistan. 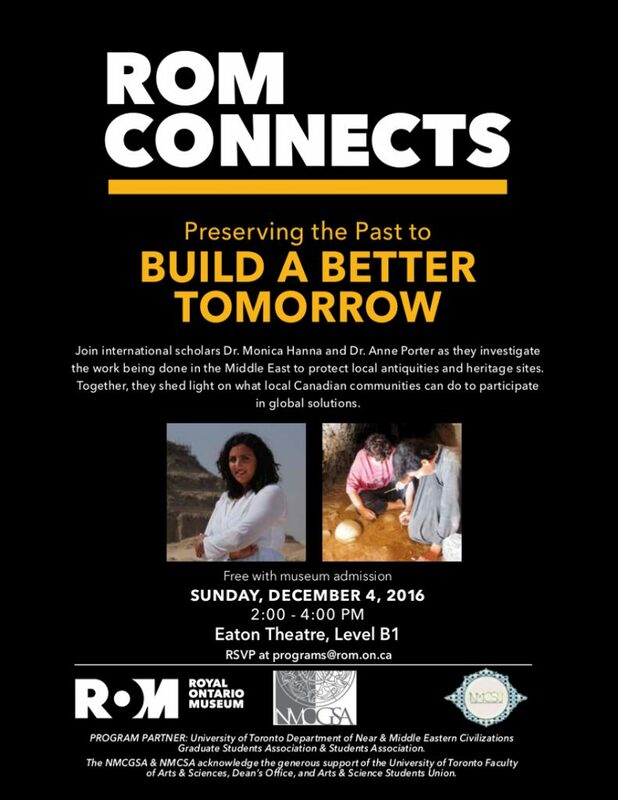 This event is a collaboration between the NMCGSA, NMCSU, and the Royal Ontario Museum. The organizers gratefully acknowledge the support received by the NMC department, UofT’s Faculty of Arts & Science, and the Arts & Science Student Union. This event will also be a fundraiser in support of the NMC-CESI initiative. Please visit the link for more information about this exciting and important initiative! This entry was posted in Fall 2016, NMCGSA Calendar, NMCGSA Events, RSVP, Seminar and tagged Fall Event. Bookmark the permalink.